Children’s Day celebrations at The Shri Ram School, Aravali, saw the tables being turned today, with the teachers presenting a ‘Form Morning’ to the children of junior school. 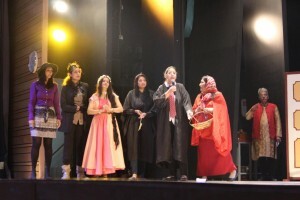 Drama, dance and music kept the children enthralled as their favourite fairy tale characters (accompanied by visitors from Hogwarts) brought home the message that, while there is both good and bad in each of us, it is our choices which make all the difference. A surprise visit by our very own ‘J. K. Rowling’ to announce her latest book, The Shri Wizard would, most certainly, have had children searching online for proof of the same!